Lauch Date For ClientExec 4.1 Closely Approaching! For all of you current fans, or prospective buyers, ClientExec has announced a sneak peak into their next version release, version 4.1! As current customers can attest, ClientExec is known for its highly customizable and intuitive interface, and seamless integration into any environment. Together, these features make this billing system one of the most popular choices among resellers. So, what can we expect ClientExec to bring us with this latest version? If you’ve been waiting for stock control, you’ll be excited to know that this will be included in the new ClientExec version. They have created a user-friendly system that is still capable of producing powerful results. You will be able to fully control all of your offerings and the quantity of each. You also have more control with how your system displays out of stock products and such as hiding the prices for the products you have sold out of. For those of you who have been requesting an easier system in which to sell things other than web hosting, your requests have been heard! ClientExec 4.1 will now be designed to allow you to more easily sell products such as, hosting related products, domains (including single domain names), SSL, and the ability to bundle any combinations of these together! Also, you will find a lot of updates to the admin UI that will make things a little easier on you. These updates include the ability to see who else is viewing the same page and the ability to quickly go back to the last five tickets previously viewed. Also within ClientExec’s admin interface, you will now be able to automatically save the dynamic grids throughout the interface so that you can customize each grid to your needs. ClientExec has also added more options to customize the grids as well such as, hiding, sorting, ordering and filtering. If you liked the ‘Team Status’ module, you’ll appreciate the fact that they are adding more updates to this. You will also find a new design with the frontend templates. This will give a fresher appearance and can be integrated easily into any website, as the new template is written with half as much HTML and CSS coding. ClientExec has not yet set a release date for their latest version; but don’t worry, we’ll keep you updated as we know how anxious you ClientExec fans can be about new version releases! When it comes to software for hosting and reselling, the current market traditionally relies on selling licenses with set terms. This is by far the most popular business model, but as more and more companies are offering subscription based options that generate more revenue, the market as a whole is shifting towards an SaaS or subscription as a service business model. Plesk, cPanel, and many of the other major names in hosting software are already offering this as an option, and it is proving to be a major revenue generator. When someone is first considering hosting or reselling, they want to know that they can generate results and revenue before committing to a long term license. Trial licenses can be effective for this, but as ClientExec, WHMCS, and others are learning, the subscription as a service business model is simply more effective, offering the option to pay for the rights to use the software monthly rather than requiring that customers make a long term commitment. Monthly prices often generate higher overall revenue over the same amount of time as a traditional license while giving the consumers more control over whether they keep software that they may not like. Hosting licenses are starting to be phased out, at least in the way we think of them now, and subscription based hosted licenses for online software seems to be the market trend that we will see the most of in the years to come. The needs of consumers are always changing, and it is the role of software developers to ensure that programs such as Plesk and cPanel are keeping up with these needs. 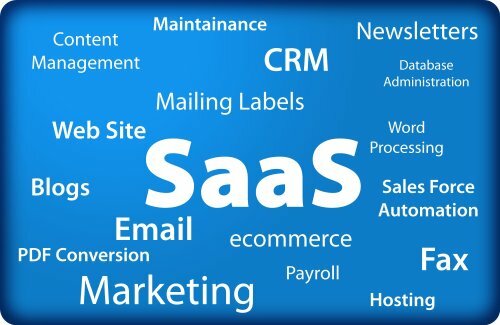 Subscription as a service licensing makes things easier for consumers and more profitable for software sellers, providing benefit to all involved that certainly increases the chances of this becoming a permanent trend. In these trying economic times, gaining new customers is harder than ever. It can also end up costing you more than you make in the process, especially given how many providers are out there offering the same services. In light of this, one thing that you certainly need to focus your attention on in a major way is retaining the customers you already have. Customer retention is much easier than gaining new customers, and you will find that doing all you can to improve retention ratings is crucial. 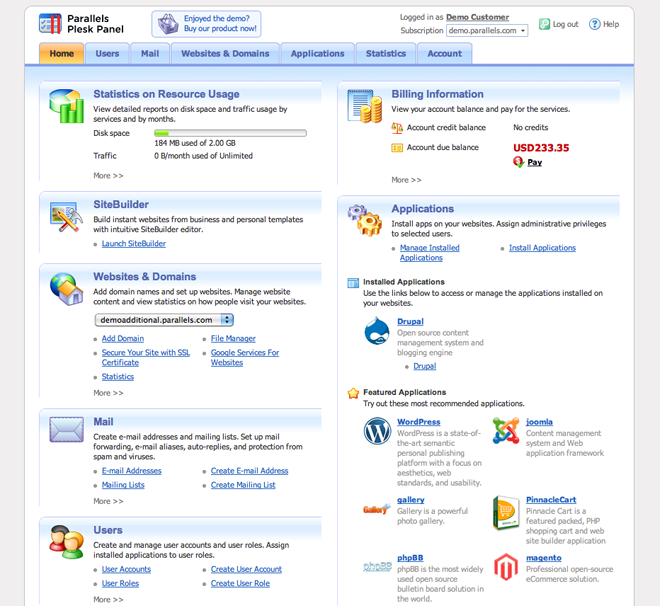 Adding new cPanel add-ons, including an online script installer, or offering an online sitebuilder can be a great way to maintain customers. Providing your existing customers with new features is certainly one of the best ways to maintain your current base and even to draw in a new group of consumers. You will find that offering options such as RVSiteBuilder can be very effective, and giving your customers an online control panel that is easy to use and customize is certainly crucial. RVSkins can help you tailor the control panel to meet the needs of your consumers, while both cPanel and Plesk are developer friendly enough to help increase retention on their own. In addition to providing new features, you will find that providing better support and services is imperative, especially in today’s economy. Your customers want services that meet all of their needs and that simplify them. Offering a Softaculous license can help benefit consumers in a major way, while also allowing them to automate processes they might not have been otherwise able to accomplish themselves. This online script installer makes it simple to install more than 176 different scripts with a single click, including WordPress and many other popular options. At the end of the day, improving features and service for existing customers is going to greatly improve retention and will also serve to bring in new customers along the way. While cPanel may be the most easily recognized control panel on the market, it is not necessarily the right choice for every web hosting provider or reseller. Plesk, offered by Parallels, is another fantastic option and one that is well worth considering. It has a cheaper bottom line than cPanel, which certainly increases its appeal, and it also has a very clean interface that many users find much simpler to figure out than cPanel and some of the other big name control panels on the market. It operates cleanly from within both the Windows and Linux environments and is perhaps the most stable control panel on the market, all things worth considering. Plesk also integrates incredibly easily with WHMCS, which allows customers to easily promote their hosting services while relying on WHMCS to provide the bulk of the hard work and eliminating the need for manual provisioning. Plesk also provides the ability to easily and seamlessly move accounts from other control panels and supports a wide range of different languages, which makes it ideal for companies that service multiple countries. Security is provided through HTTPS, which is also a major plus for Plesk, especially for businesses who intend to make use of the Plesk Billing Software. Plesk really does have a lot to offer. Whether or not it is the right control panel software for you is something you will have to decide, but it is certainly quite beneficial in many ways. With an unlimited license, it even includes billing software and a sitebuilder, as well as the ability to install Softaculous for simple installation of scripts. The bottom line is that for many Plesk is an ideal option, especially when integrated with WHMCS, and it is certainly something that most hosting providers and resellers will want to take the time to consider. When you are looking to buy a license, it is important to realize that not all sellers are the same and that not all products are the same. The seller you choose should serve to simplify everything about the licensing process for you. When you purchase one or more licenses and pay for them, you should be able to point and click and know with certainty that your licenses are activated, and LicenseCube works to ensure that this is just what you get. We work to take simplicity to the next level. LicenseCube knows that whenever you are looking to purchase licenses, having someone who can assist you if needed at any point before or after your purchase matters, and we work to make sure this is always an option. We also work to ensure that we run the gamut when it comes to options, including automated bulk discounts for licenses on popular choices such as cPanel, WHMCS, Plesk, and RVSitebuilder. We also work to offer the most comprehensive line of top quality web hosting software. Our bulk licenses and hosting discounts make it easy for you to get what you need. 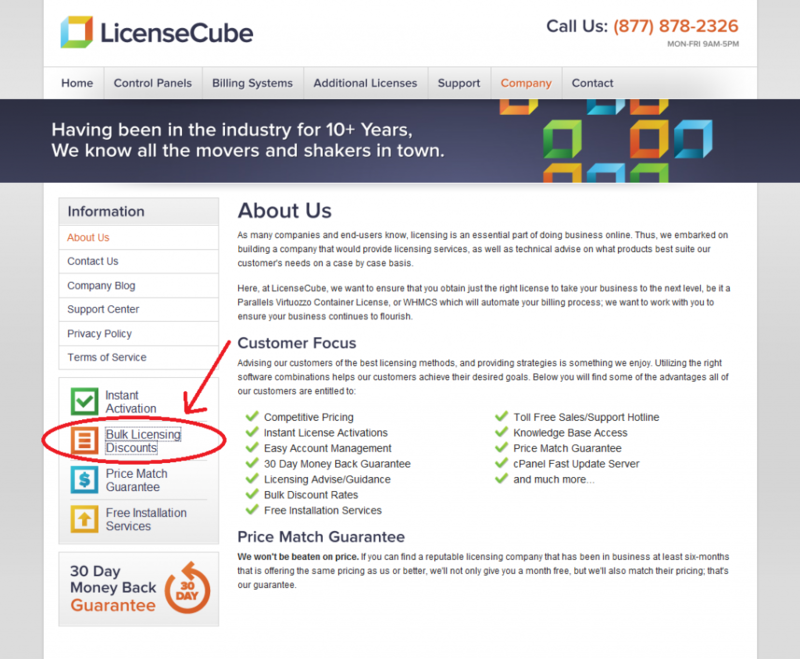 LicenseCube offers a number of perks for those buying bulk licenses, including automated discounts and one-time bonus credits. We also offer API and iPhone Apps in addition to leading software such as cPanel and Plesk. We ensure that purchasing the best software in the business, such as WHMCS is always simple, and we make bulk licensing the most affordable and attractive option without making it difficult to activate each of your licenses. In all, we work hard to ensure that your task is simple. Choose the licenses you want, determine how many are needed, and click. We’ll gladly handle the rest so that your licenses are active and ready to go. 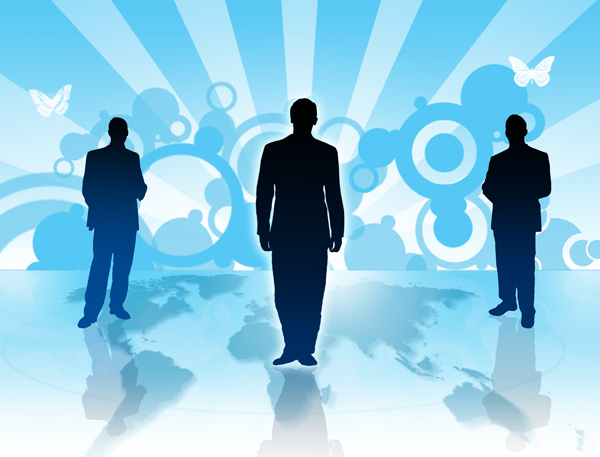 As a hosting or reselling provider, you need to be able to maximize in order to survive in the current economy. This means maximizing your time in terms of server creation, partitioning, and destruction. It means maximizing your resources in terms of what is required for every website to run on your servers. And it means maximizing your money by finding the most cost effective way to create websites and servers. The best way to accomplish all of this and more is simple- virtualization. Using virtualization technology such as Parallels Virtuozzo is simply a wise business move. This can help you save thousands of dollars on hardware, because Virtuozzo can create virtual private servers on the fly, creating and destroying them on the fly as you need the resources. Offering virtualization can also help by ensuring that you are providing your customers with a new service option that can help greatly increase your overall revenue. Virtualization lets you utilize virtual servers that are independent of one another, providing great benefit to your customers and end users and allows you to virtualize resources as well, ensuring that every server has the amount of resources needed at any given moment rather than creating equal distribution through a physical server. 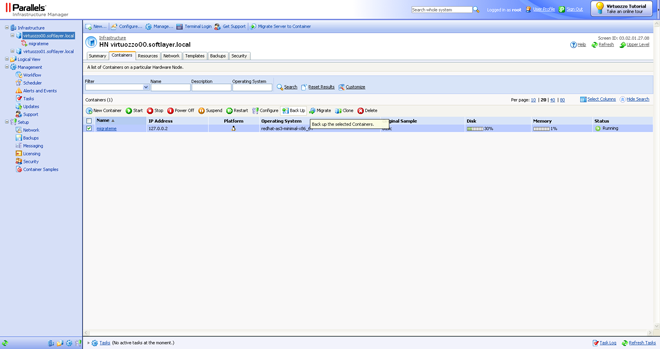 WHMCS is also an important part of top level virtualization. You will find that using WHMCS with Virtuozzo lets you fully automate the creation and destruction of virtual private servers as well as to make needed changes to these servers on the fly. WHMCS also ensures that everything you need is automated, which means that there are no more manual container updates. When you combine Virtuozzo and WHMCS, the end result is a powerful virtualization option that can help you conserve money, time, and energy while actually improving the product offered to the end user.